The north end of Boston. Mafia Country. When mobster Richard "Red" Scarlotti's son goes missing, Dylan Thomas Lonagan, a private detective with truckloads of baggage, is hired to find him, and lands himself in the middle of a mob war. As two crime families try to settle old scores, Lonagan is forced to ally himself with Red's hitman brother, Whitey, a hard nut with a soft side and a secret of his own. Together, Lonagan and Whitey make a dangerous, desperate team. Searching to find the missing boy, they dodge bullets from cold-blooded assassins and daggers from the women they love, only to discover that, sometimes, the two are one in the same. In the end, these dirty saints will learn that the road to Heaven is paved with bloody hands and bad intentions. Mike Miner lives and writes in Connecticut. He is the author of Prodigal Sons (Full Dark City Press) and Everything She Knows (Solstice E-Books). His stories can be found in the anthologies Protectors: Stories to Benefit PROTECT and Pulp Ink 2 as well as in places like All Due Respect, Burnt Bridge, Narrative, PANK, The Flash Fiction Offensive, Shotgun Honey and others. 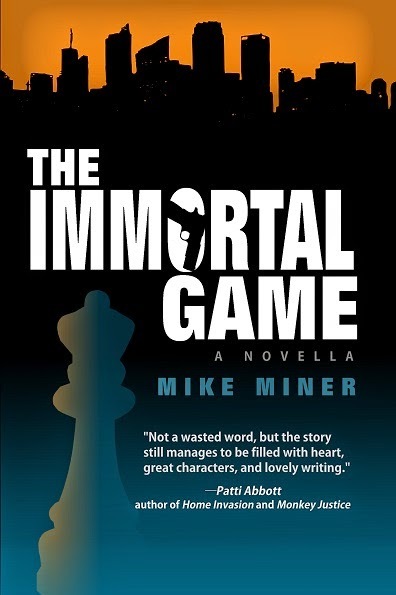 "Spare, razor-sharp prose, deftly drawn characters and a switchbacking plot drive The Immortal Game. There's no shortage of blood and brutality but it's the surprising humanity that Miner finds in even the worst of his characters that gives this mob story a unique twist." "Not a wasted word, but the story still manages to be filled with heart, great characters, and lovely writing. " "What I like about Mike Miner's writing is that he strives for beauty and at times he strives for poetry. At times he's elaborate, at times he's rococo, and at times he crashes, and at times he burns, and at times he takes flight. Infuse this with hardboiled crime and it's singular, it creates something unique."